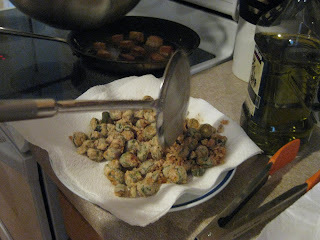 I had never eaten fried okra before I met SPH. Now I could eat it every week if I let myself. Actually, recently I've let myself...we had it the last two weeks in a row. Perhaps I am trying to appease my lack of chocolate with other yummy, yet not-so-healthy foods. 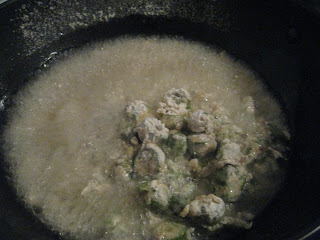 I could try and spin fried okra as a way to get your child interested in a healthy new vegetable, but I won't. I will simply tell you that french fries or onion rings, on their best day, never tasted as good as SPH's fried okra. 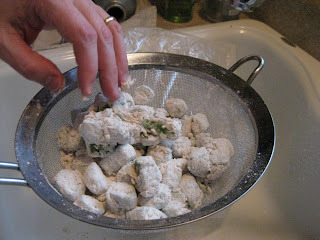 The beauty of this recipe is that the only thing SPH uses to make his fried okra is flour, seasoning and lest I forget to mention, gobs of oil. It is the flour that makes this taste so simply delicious. 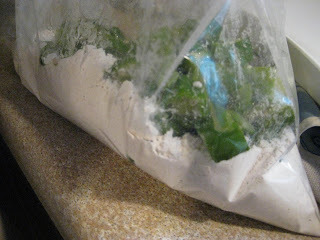 Sprinkle with a bit more salt, if desired. Now try and get them to a plate before you eat. them. all. This is the meal that SPH cooked for us...any wonder why I am crazy about him? Excellent! Thanks for posting this. I can't wait to give it a try! Gobs. I think I hate that word. "Gobs" is always used when describing loads of something that isn't good for me. Like "gobs of chocolate" or "gobs of oil". It's never "gobs of green beans". And nice work SPH. I too have a cooking husband and they are handiest things. I love, love , LOVE fried okra. Might include it on the Mother's Day menu since it's one of my mom's faves too. Also, hit the HEB today and they installed a make your own granola bar by the bulk section. You get the choice of oat or flakes and then about 20 different mix ins - dried fruit, nuts, and carob chips. I'll try to send pictures if I ever figure out my phone. I LOVE fried okra! I will have to try this recipe. I'll have to save this and make it for my dad!! 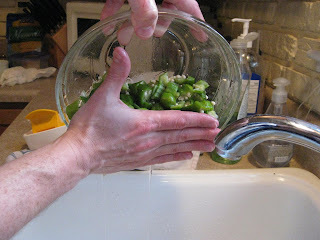 He would always love to get fried okra when I was a kid, not sure how long it's been since he's had it, but it would be a great surprise to make for him!! 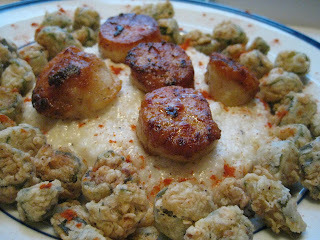 I have never ever been a fan of Okra, but you take something and fry it and I'm always willing to give it a try. I think I was forever put off them by bad experiences with the slimy veggies while visiting family in the south as a kid. Perhaps it's time to revisit them! Made this last night and working on a post for it. Delicious. 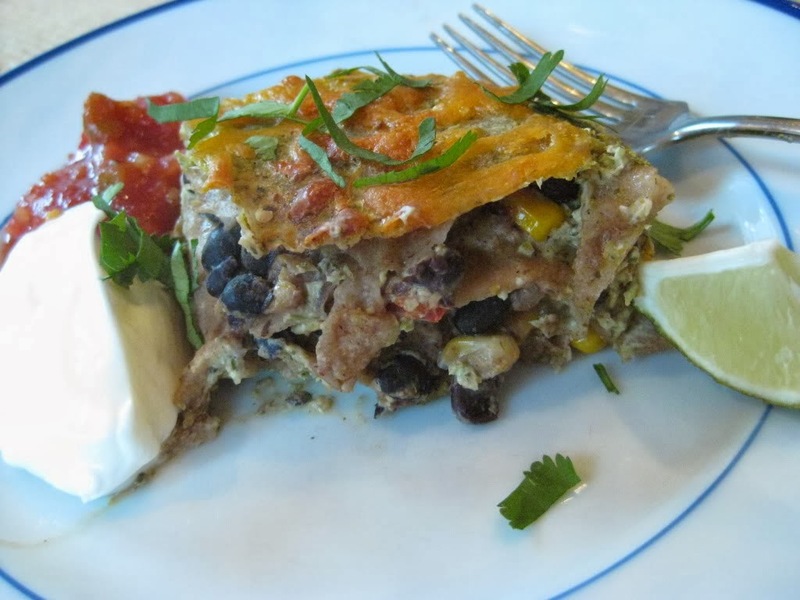 Finally made this recipe and my stomach is bursting. LOOOOOVED it!